The Sword of Bard the Bowman - Hobbit(UC3264) Officially Licensed Swords and Weapons made by United Cutlery and other manufacturers from The Hobbit movies. Bard the Bowman was the heir of Girion, the last Lord of Dale, and one of the most proficient archers of men. He wielded Girion’s ancient sword and was keeper of the last Black Arrow of Dale, which he used to slay the great dragon Smaug during the attack on Lake-town. Bard then fought alongside the elves and dwarves against the armies of Azog in the Battle of the Five Armies. He rallied his forces to lead the main defense against the orcs and trolls in the ruins of ancient Dale, bravely wielding his sword in victory over the enemy. The Sword of Bard the Bowman features a hilt bearing design motifs of ancient Dale, with a pommel in the shape of twin bird heads and a leather wrapped grip embossed with an overlapping scaled feather pattern. The blade is made with stainless steel and adorned with engraved grooves and a rune etching. 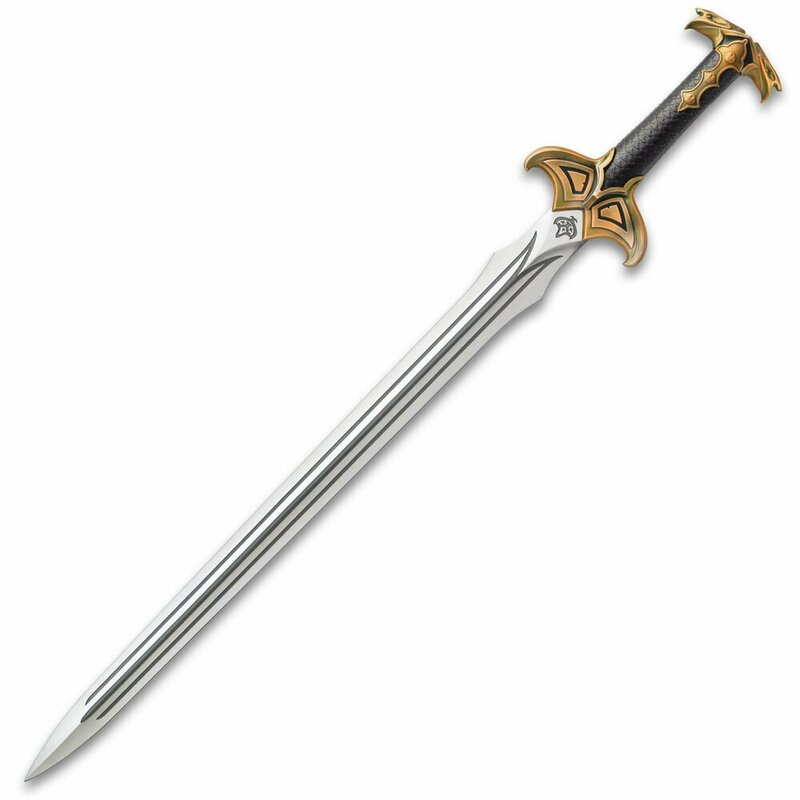 This officially licensed, authentic replica sword from The Hobbit Trilogy is a must-have for your collection.